Narrative history at its most compelling, After the Prophet allows readers to grasp the power and depth of the Shia-Sunni split as never before. Even as Muhammad lay dying, the battle over who would succeed him as the ruler of the Muslim people had begun. 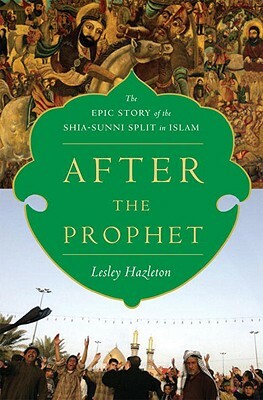 And as Lesley Hazleton shows in her gripping history After the Prophet, the battle has never ended. This is the foundation story of the Shia-Sunni split in Islam, a magnificent tale of power, intrigue, assassination, and passionate faith. Starting in Arabia in the year 632 and reaching its terrible breaking point fifty years later in Iraq, it still shapes modern headlines from Iran’s Islamic Revolution to the Iraq civil war. The succession crisis set Muhammad’s son-in-law, the philosopher-warrior Ali, in opposition to the controversial Aisha, Muhammad’s favorite wife. She would defy all expectations by leading an army against Ali, urging on her warriors in the thick of battle. The ultimate breaking point came when soldiers of the first Sunni dynasty massacred seventy-two warriors led by Ali’s son, Hussein, at Karbala in Iraq, forging the Shia-Sunni split in blood. Hussein’s ordeal would quickly become the Passion story at the core of Shia Islam, and history would be transformed into sacred history. Balancing past and present, Lesley Hazleton shows how this story is alive in Middle Eastern hearts and minds today, as though it had just happened. Even as she tells what happened in the seventh century, she never lets the reader lose sight of where those events have left us, and why they matter so much now as the struggle for dominance in the Muslim world plays out in the cities and mountains of Iraq and Iran, Pakistan and Afghanistan. Placed squarely at the volatile intersection of religion and politics, history and current events, the vividly narrated After the Prophet is compulsive reading—and an emotional and political revelation for Western readers. British-born Lesley Hazleton is a psychologist and veteran Middle East journalist whose work has appeared in the" New York Times, Esquire, Vanity Fair, Harper's The Nation, New Republic, New York Review of Books," and other publications. The author of several acclaimed books on Middle East politics, religion, and history, including "Jerusalem, Jerusalem "and "Mary: A Flesh-and-Blood Biography of the Virgin Mother," she now lives in Seattle, Washington. “After the Prophet vividly re-creates the personal rivalries and resentments that led to Islam’s great schism in the immediate wake of Muhammad’s death, and makes one understand how truly contemporary they are with our own time. Lesley Hazleton brings off the happy effect of turning the reader into a participant in the world she describes—a world of long memories, where the deep past lives on in the present day, as if the Battle of Karbala in 680 A.D. was little more than an eyeblink away from the Ashura Massacre there in 2004.